Hydroponic growers who really want the best of the best choose CANNA AQUA. 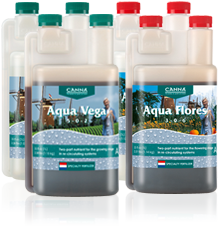 The CANNA AQUA range of products consists of the nutrients CANNA Aqua Vega, CANNA Aqua Flores and CANNA Aqua Clay Pebbles. Thanks to a meticulous control of the nutrient supply during the growing and flowering phase of plants, CANNA AQUA nutrients ensure a superior yield. The AQUA nutrients are fed directly to the plant’s roots. The formula is made so that the plants regulate the pH themselves. Therefore the pH in the nutrient tank remains within the optimum pH range. This means having set the correct starting pH, no further correction is necessary. Plants do not absorb all nutrients in equal amounts and speed. This means that the composition and pH level of the nutrient solution changes over time. CANNA AQUA nutrients have been developed in such a way that the plants can always absorb the correct combination of nutritional elements that are necessary for optimum growth and bloom. Thanks to two different nutrient solutions for the vegetative (Aqua Vega) and generative (Aqua Flores) phase of the crop, the pH remains as stable as possible. This makes CANNA AQUA unique compared to most other existing nutrition formulas. One of the most complex cultivation systems made easy by CANNA AQUA! CANNA AQUA answers to strict quality requirements. The correct formula was found after years of testing and fine-tuning and an unprecedented high number of cultivation tests in the CANNA Research laboratories. CANNA also used the expertise of a select group of growers. This unique combination of laboratory and field tests resulted in an enormous amount of information. The result is that CANNA AQUA distinguishes itself in versatility, stability, yield and ease of use.